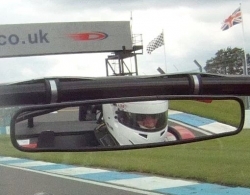 So here's a compilation of all six starts this year - in order, they are at Donington Park, Brands, Snetterton, Rockingham, and then the two extra end-of-season races at Donington Park again. They say it's not over til the fat lady sings. Well, we had the singing last night, so I guess it's all over now. 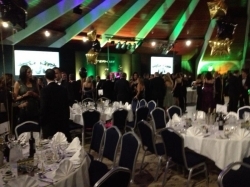 Yes, the Caterham Motorsports Awards 2012 were held last night, marking the official end of the season. 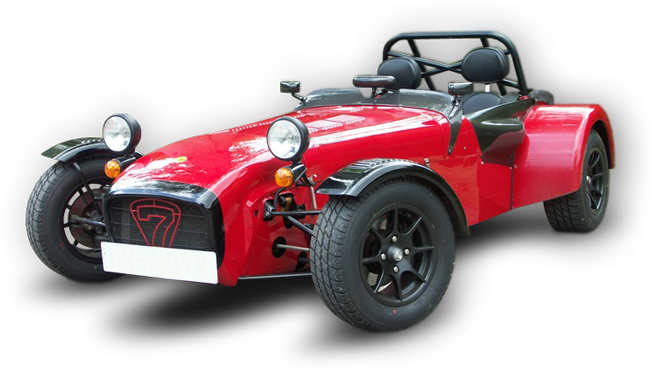 All of us (or nearly all) congregated on the Effingham Hotel in Surrey for the night, kindly and thoughtfully kitted out with a bright yellow Caterham Supersport R in its reception to let us know we'd found the right hotel. Dinner was served, prizes were given out, and then the partying started. ...took place this morning. Look at the before and after pictures to spot the difference. Yes, the novice cross has gone. The reason is, I'm not a novice any more! To be honest, all the other stickers have come off as well. But that was the big one, as it were. They're off so that the car can have some winter TLC and get some of its upgrade to Roadsports spec, the next rung up on the Caterham motorsport ladder. The car had a thorough clean this morning, and a rub down with a degreaser to get the residue from all the stickers off. It is now on axle stands with all four wheels off and the damaged left-hand wheel arch removed. Well, it's over now. 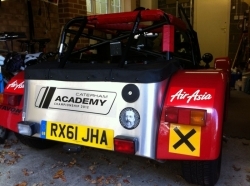 The 2012 Caterham Academy is finished, we have held all the events, run all the races, we even held an extra race after the season just for those that couldn't bear to end it. But it has all now finished; there are no more driving events on the calendar, and the car is breathing a well-earned sigh of relief in the garage. The sun sets... literally. The second race on Sunday (see previous post for the first race) was rescheduled following the fog that morning for a 5:56 start. Our 13 minute race would therefore continue until at least 6:09, one minute prior to the time I had noted as sunset the day before. The photo makes it look slightly darker than it actually was, whereas the video looks lighter. Either way, the light was failing and were were asked to use both our headlights and our very-bright FIA rain lights.